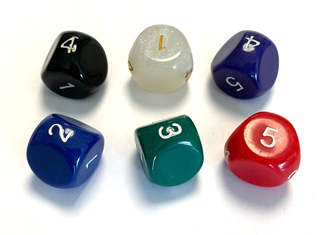 The Dice Lab d3 features large easy-to-read numbers. This die can't land on the specially-angled end faces due to the location of its center of gravity. Single die, available in blue, red, green, white, and black. Color choice can be specified in the shopping cart. 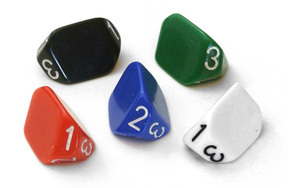 The Dice Lab d3 features large easy-to-read numbers. This die can't land on the specially-angled end faces due to the location of its center of gravity. Set of five, default colors are one each blue, red, green, white, and black, but a different combination can be specified in the shopping cart. 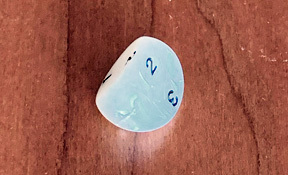 Three-sided d3 die with a unique geometry. Available in white, purple and black at this time. Color choice can be specified in the Shopping Cart. Three-sided d3 die. In translucent blue or opaque pearl white. Color choice can be specified in the Shopping Cart. A d3 with Roman numerals. Two sides each are labeled I, II, and III. We currently have white and blue in stock. You can specify your color choice in the Shopping Cart. A d3 with two sides each with one, two, or three dots. (The upper die in the image is a reflection in a mirror.) Only available in white. 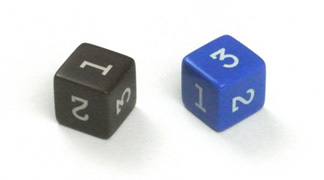 Six-sided die marked with two 1s, two 2s, and two 3s. Available in brown or blue; you can state your color preference in the Shopping Cart, but we'll substitute another color if necessary. 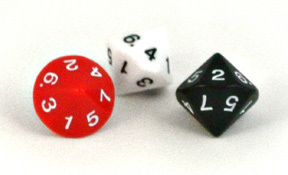 Five-sided d5 die. We normally stock black, white, red, green, blue, and purple. You can specify your color choice in the Shopping Cart. Note that this design is not isohedral. 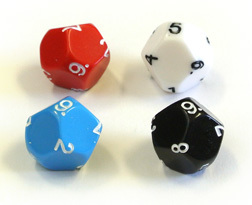 Seven-sided d7 die. This design is based on spacing points as equally as possible on a sphere and then cutting planar slices perpendicular to those directions. We currently stock black, white, red, and blue. You can specify your color choice in the Shopping Cart. Note that this design is not isohedral. 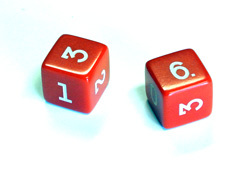 Seven-sided d7 die, with dots indicating 1-5 and numerals indicated 6 or 7. The shape of the die is a pentagonal prism. Available in black or white. 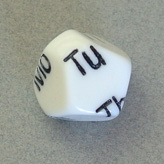 Seven-sided die labeled Mo, Tu, We, Th, Fr, Sa and Su. This design is based on spacing points as equally as possible on a sphere and then cutting planar slices perpendicular to those directions. Only available in white. Note that this design is not isohedral. Nine-sided d9 die. This design is based on spacing points as equally as possible on a sphere and then cutting planar slices perpendicular to those directions. We normally stock black, white, red, green, blue, and purple. You can specify your color choice in the Shopping Cart. Note that this design is not isohedral. 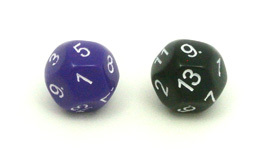 These two six-sided dice together create a fair d9 "die". Rolling the pair and adding the numbers has an equal probability of resulting in each of the numbers 1-9. Designed by Eric Harshbarger. Laser etched and hand inked. Available in red and blue, though we may not have your color choice in stock. 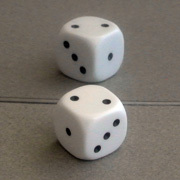 Eleven-sided d11 die. This design is based on spacing points as equally as possible on a sphere and then cutting planar slices perpendicular to those directions. We currently stock white, red, green, blue, and purple. You can specify your color choice in the Shopping Cart. Note that this design is not isohedral. Roll a card, any card, with this novel pair of dice! The large 13-sided die chooses the value and the four-sided die the suit. Together they randomly select a card from a standard 52-card deck. Use them instead of cards or along with cards. Invent new games or variations on classics. Give them a shake and give your luck a roll! Available in black, white, red (an orangish red), blue, and green. You can specify your color choice in the shopping cart. Note that these dice are not tumbled, making the shapes more precise, but small pits from the injection molding sprue are visible. Roll a card, any card, with this novel pair of dice! The large 13-sided die chooses the value and the four-sided die the suit. Together they randomly select a card from a standard 52-card deck. Use them instead of cards or along with cards. Invent new games or variations on classics. Give them a shake and give your luck a roll! Buy a set of five pairs and save $5. Available in black, white, red (an orangish red), blue, and green. You can specify your color choice in the shopping cart. Note that these dice are not tumbled, making the shapes more precise, but small pits from the injection molding sprue are visible. Thirteen-sided d13 die. This design is based on spacing points as equally as possible on a sphere and then cutting planar slices perpendicular to those directions. We normally stock black, white, red, green, blue, and purple. You can specify your color choice in the Shopping Cart. Note that this design is not isohedral. Fifteen-sided d15 die. This design is based on spacing points as equally as possible on a sphere and then cutting planar slices perpendicular to those directions. We normally stock black, white, red, green, blue, and purple. You can specify your color choice in the Shopping Cart. Note that this design is not isohedral. Seventeen-sided d17 die. This design is based on spacing points as equally as possible on a sphere and then cutting planar slices perpendicular to those directions. Available in white, red, blue, green, purple and black. You can specify your color choice in the Shopping Cart. Note that this design is not isohedral. 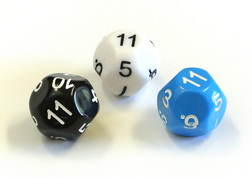 Nineteen-sided d19 die. This design is based on spacing points as equally as possible on a sphere and then cutting planar slices perpendicular to those directions. Available in white, red, blue, green, purple and black. You can specify your color choice in the Shopping Cart. Note that this design is not isohedral. 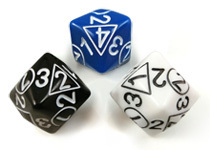 The d2/3/4 is three smooth-rolling dice in one. 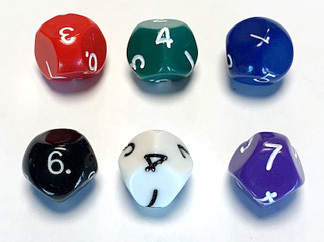 The middle number is used to read the d3 value (1-3), the number set in a triangle the d4 value (1-4, think of a traditional d4), and the number set in a circle the d2 value (1 or 2, think of flipping a coin). Available in white, blue and black. You can specify your color choice in the Shopping Cart. 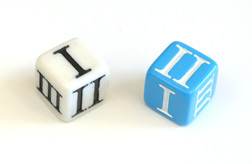 Buy a set of three d2/3/4 MultiDice. Available in white, blue and black. 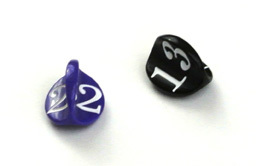 Save $2 over the price of three individual dice! 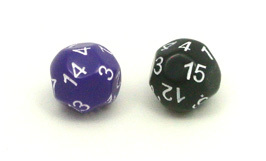 A ten-sided die numbered 1-5 twice. This design gets around the problem that there are no fully symmetrical five-sided polyhedra. We currently stock red, green, and blue. Color preference can be stated in the shopping cart. 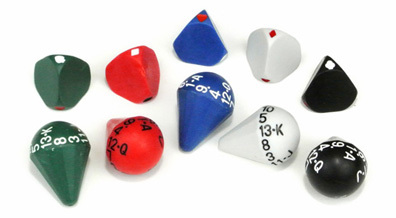 A 14-sided die numbered 1-7 twice. This design gets around the problem that there are no fully symmetrical seven-sided polyhedra. We usually stock black, white, and red. Color preference can be stated in the shopping cart.